Such helpful people! thank you for your shop tips. I’ve got another query for you. 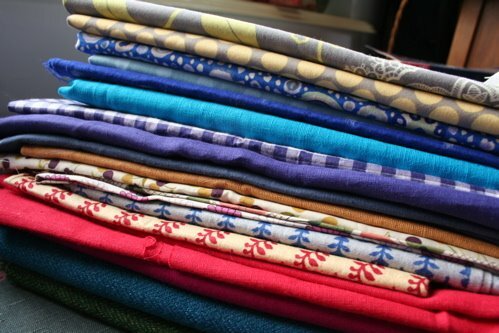 I’m working on a fabric guide – not huge, but varied. I can’t decide how to categorize it. Originally it was by fabric weight – upholstery, medium, dress, sheer and then some random other stuff like vintage, recycled, non-woven, organics. Now I’m wondering about doing it by type; wools, cotton/linen, silk, synthetics and then organic, vintage etc. But that approach doesn’t work for everything. I can’t decide what would be most useful – type of fabric or weight, or something else entirely? 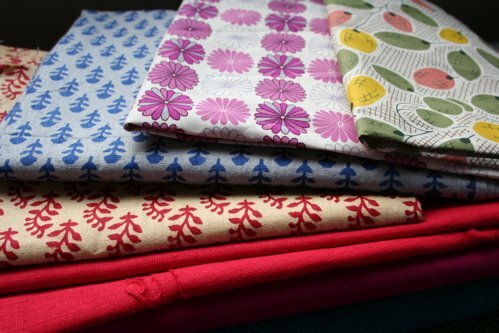 Fabrics I love, fabrics I wont touch with a bargepole? What do you think? How do you categorise fabrics? I go by weight first, then fibre content. The only special categories I look at are vintage, outerwear and home decor. I agree with the weight, then fiber catagorization. Then maybe a seperate catagory for vintage, organic, and fabrics to avoid “bargepole”. Tough one – I generally go by feel (which I guess is fibre) and colour/print to decide whether it’s in or out, then the weight dictates what can be done with it… But I’m a bit of a fabric floozy – what comes under ‘bargepole’? Crimpolene? Lycra? Hideous prints? If we’re talking about dressmaking then it’s all about weight and hang isn’t it? stiffness or fluidity/solid or sheer / washable or drycleanable etc etc.And will you please make sure there is a separate box for the difference between a fibre and a weave. I had to control the rage during a wedding dress trying on sesh (purely research – of course I’m making mine) when i asked what the fabric was ‘oh it’s satin’ ‘silk or…’ ‘no just satin’. IT HAS TO BE SOMETHING.Sorry I’ll just dismount from my high horse.